Oil-Free Buffalo Sauce Dressing is spicy, savory, tangy, delicious and wonderfully free of added oils. Many dressings are laden with added fats to serve as a carrier for the peppery heat and other flavors; but not THIS sauce! It’s made using three wholesome ingredients, and it’s ready in five minutes! My most memorable cooking experience ever is the one that ultimately led to the creation of Oil-Free Buffalo Sauce Dressing! The first time I ever had buffalo wings was many moons ago when I was a college freshman. My new suitemate was from Buffalo, New York. Some students arrive on campus toting hair dryers and mini-fridges; Deb brought a mini fryer and borrowed my dryer. We became fast friends. After Deb shared a batch of buffalo wings, I completely understood her reasoning for prioritizing a fryer as a necessity for her first year at college. But while we joyfully filled the entire dorm with the aroma of Buffalo wings and hot sauce with our first ever batch, we also landed ourselves in a bit of trouble. As it turned out, it was a big no-no to use a deep fryer in our dorm room – who knew? But the consequence was well worth it. For in the company of a new friend in good old Ohio Hall during my first few weeks at Judson University, my passion for spicy hot Buffalo sauce ignited. I recall putting about a stick of butter in a bowl and mixing it with Frank’s Redhot Original Cayenne Pepper Sauce. But that was then. In this recipe, I’ve lightened things up quite a bit. I’ve let go of the butter altogether but gave up NONE of the magic of the creamy spicy sauce. The secret to the creaminess is in the hemp seeds. Hemp seeds are my favorite! And you’ll love them too once you discover how they deliver creaminess along with nutrients rather than empty, useless fat. And you’re bound to love the ingredient ratio of my Oil-Free Buffalo Sauce Dressing as it is one to one to one. That’s one part Frank’s Redhot Original Cayenne Pepper Sauce, one part hemp seeds, and one part vegetable broth. How easy is that to remember? If you need more, bump it up to a cup or so of each. You get the idea! Anyhow, this is an Oil-Free Buffalo Sauce Dressing that I know you’ll use in more clever ways than I can even imagine. 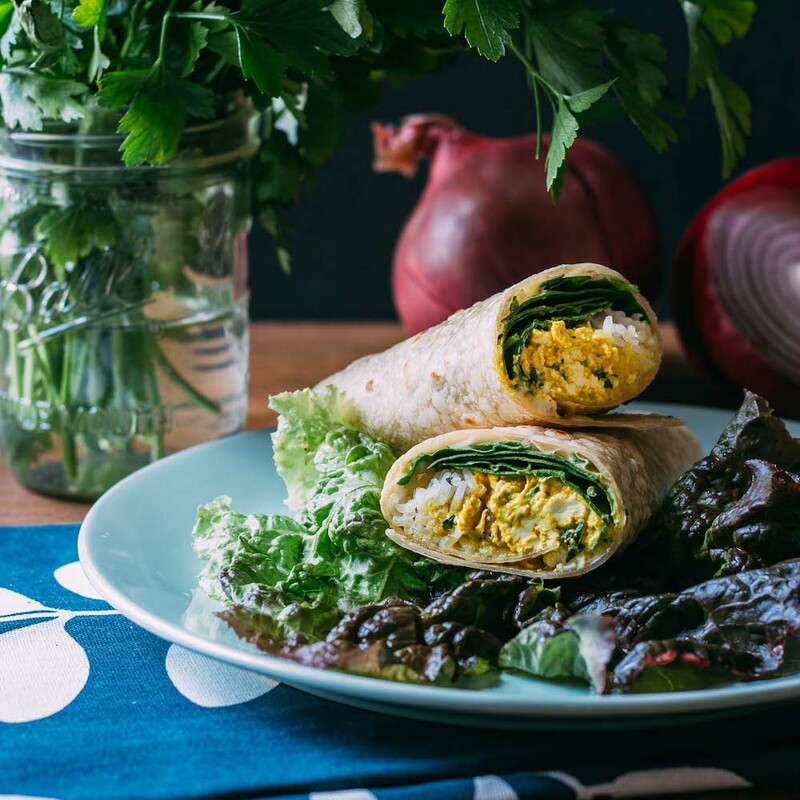 Use it as a gluten-free, dairy-free, nut-free salad dressing or a sauce for sandwiches and wraps. 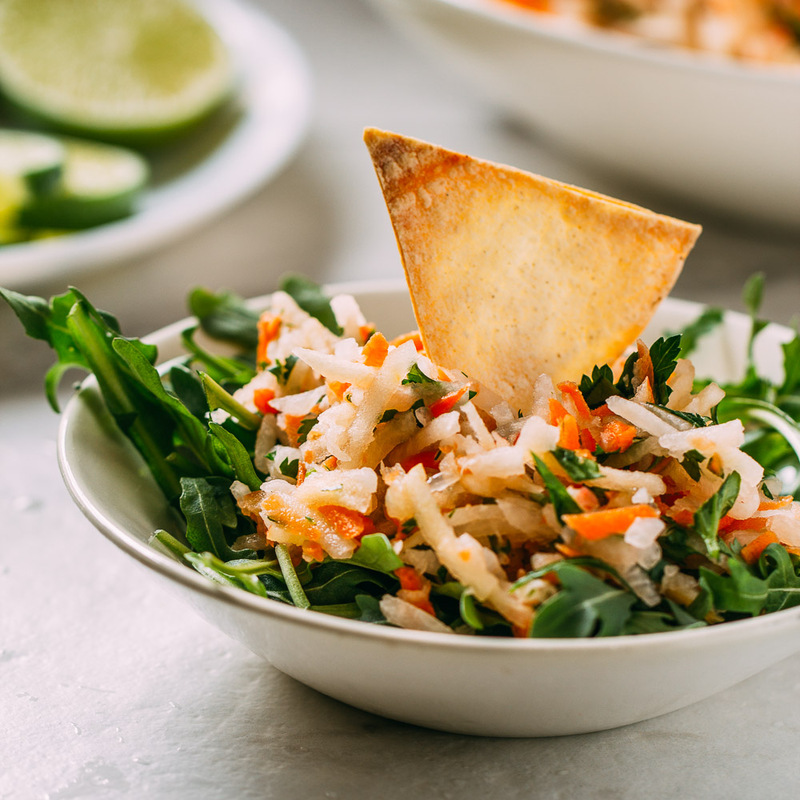 Drizzle it on your Buddha Bowls. Oh, and you’ll love how it tastes in our incredibly satisfying recipe for a Vegan Tempeh Blue Cheese Buffalo Bowl. Seriously, this dressing will surely ROCK YOUR WORLD! 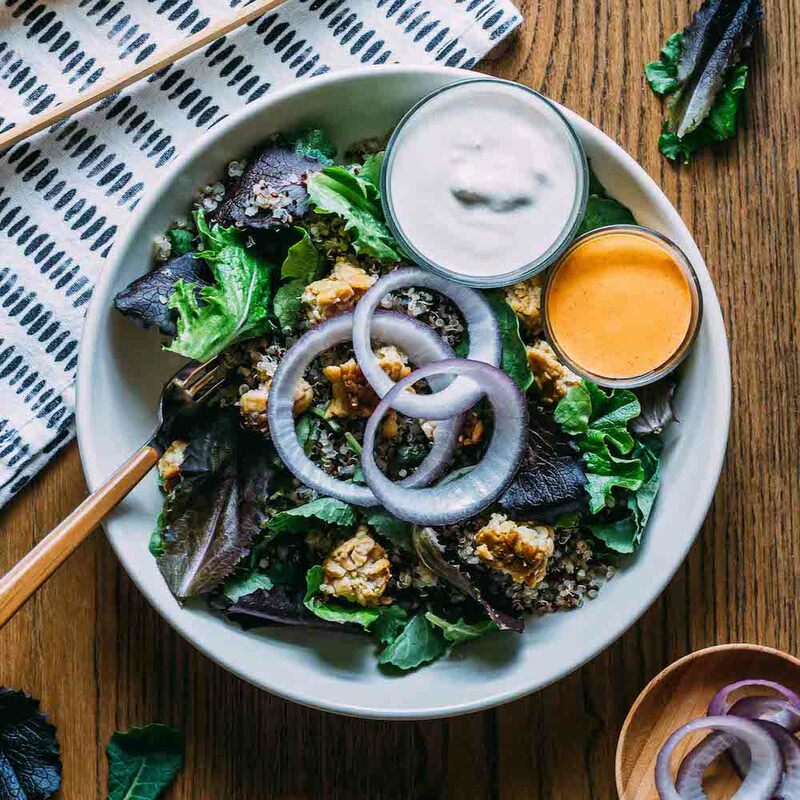 And if you’re wondering about a plant-based blue cheese dressing to go with this creamy hot sauce dressing, boy, do we have the recipe for you! As always, I’m beyond thrilled to be sharing this recipe with you! Pin it for safe keeping and to keep it handy to share with your friends. 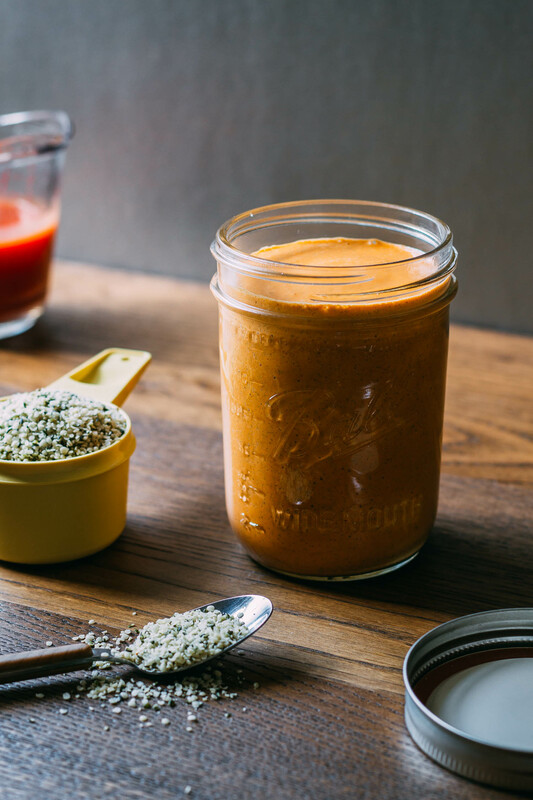 Once you’ve tried this Oil-Free Buffalo Sauce Dressing recipe for yourself, leave a kind comment and share your experience. I’d love to hear how it goes. By the way, I’m all ears if there’s a sauce or dressing from your wild and crazy past that you’d like me to makeover. 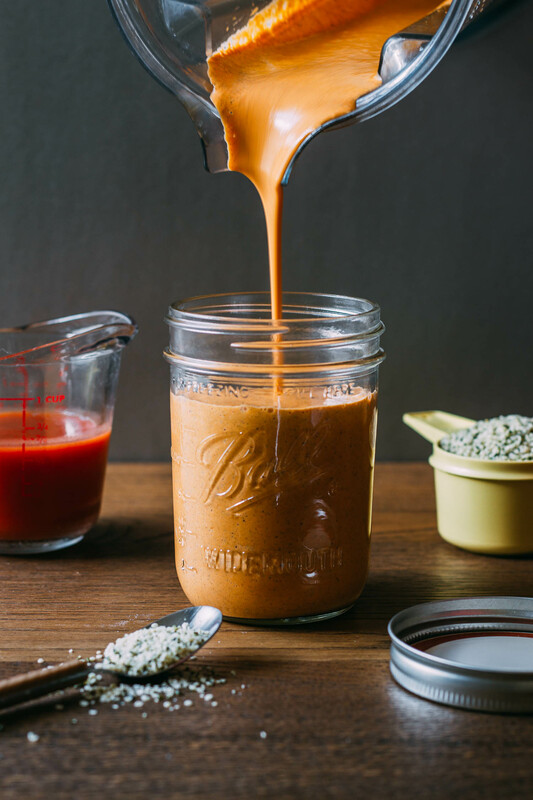 The incredible simplicity of this Oil-Free Buffalo Sauce Dressing is also its beauty. The 1 to 1 to 1 ratio makes it a dream to make for two servings or twenty…. need more, just up the measurement! It’s tangy, peppery, hot, but not too hot and downright addictive. Yes, I’ve been known to lick the bowl! This recipe makes enough for six, generous, quarter cup servings. And you’ll want to be sure to try this alongside our Buffalo Tempeh Salad with Vegan Blue Cheese Dressing! 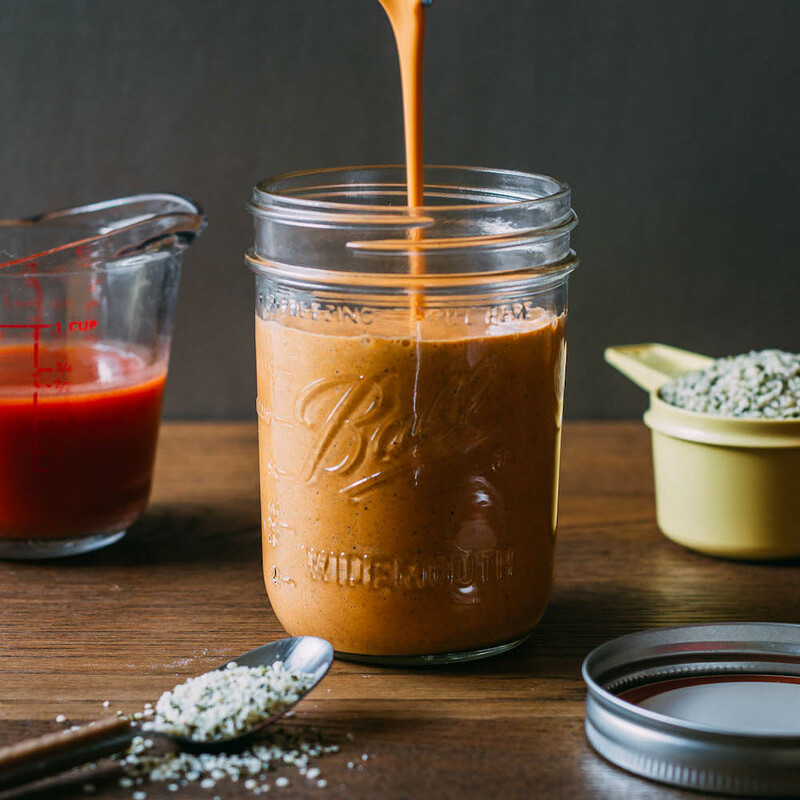 Oil-Free Buffalo Sauce Dressing is a one-step wonder! Place the three ingredients in a high-speed blender and blend until it's smooth and creamy! Enjoy as a dressing or sauce on all of your favorites. And be sure to try it as a dressing for our Vegan Tempeh Blue Cheese Buffalo Bowl - it will make an impression that will last a lifetime. While I am a huge fan of Frank's Redhot Original Cayenne Pepper Sauce, feel free to substitute your favorite hot sauce in place of Frank's.